Project Management Products on MPMM.com. Project Management Products: As a project manager, consultant, trainer or student you can use these products to manage projects more efficiently. You have invested in MPMM for your projects. We are committed to improving MPMM on an ongoing basis. Our latest release of MPMM - version 8, is now available. What's new in MPMM V8? Purchase one copy, several copies for your colleagues or buy an Enterprise license for your entire organization. The more you buy, the more you save. 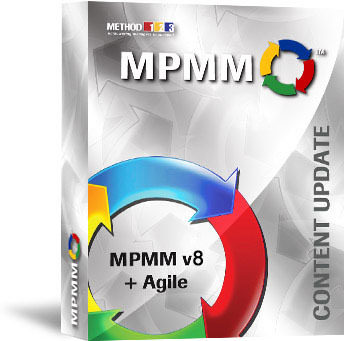 MPMM V8 is excellent for extending your knowledge and capability to manage projects. Since you have already purchased base MPMM product, you can simply import the newest Methodology. After you purchase, the download link will appear. You can import the new methodology content into your existing MPMM product. These have been revised for better wording, clearer instruction, and more consistent format. Ready for the next step - Automation. All this for only $95 USD. Question - How do I upgrade? You will be taken to a download page. Click on the link and save the new MPMM V8. You will also receive an email with a temporary download link. Click on the link and save the new MPMM V8. Enter MPMM and import the new downloaded copy. Start enjoying the new content. Question. I have updated my prior content. Will I lose my work? No, MPMM can save more than one methodology. You can save the imported content under a different methodology name. You will then have your current version and the new version of MPMM existing within the software at the same time. You can leave both versions within the software, or combine the two into one customized version. *** If you have customized your current MPMM content, we recommend you export your current MPMM content first and save it as a backup. "For small and medium sized projects, MPMM Standard is fantastic. And if you manage large projects, then MPMM Professional is a must have."